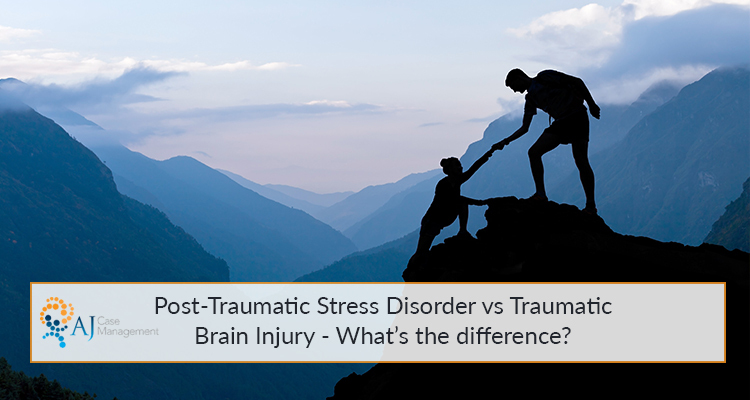 In this guide find an in-depth comparison between post-traumatic stress disorder (PTSD) and traumatic brain injury (TBI). Read their definitions, shared symptoms, differences and case studies about those living with these conditions. Looking to the future and the importance of setting goals. PTSD is an anxiety disorder that is caused by historical traumatic experiences or events. The events that cause this disorder are usually highly stressful, painful, frightening or distressing. This is how the term was coined, ‘post-traumatic’ (after the trauma), ‘stress disorder’ (a stressful event that leads to prolonged periods of anxiety and stress). Liam was 19 when he was involved in a car accident. The driver on the oncoming side of the road fell asleep at the wheel and collided with his car whilst he was driving with his friends. Liam suffered a broken wrist and one of his friends who was sat in the passenger seat experienced a minor concussion. Fortunately, the physical injuries could fully heal, but the mental trauma would not be so quick to recover. In the following months Liam was unable to suppress the traumatic intrusive thoughts and he struggled to bounce back to his happy and energetic self. He experienced frightening nightmares and felt high levels of anxiety when walking near busy roads. Liam’s friends soon noticed the change in his personality and encouraged him to seek help. His family reached out to a case manager who put him in touch with the right professionals and experts. He now has regular sessions with a therapist who is giving him the tools to combat the symptoms of PTSD. Almost a year later, he aspires to start driving and get back in a car again. Of course, PTSD isn’t always this simple. Cases vary massively, and no two stories are the same. A traumatic brain injury (TBI) is an injury to the brain caused by physical trauma to the head. This could be as a result of physical violence, road traffic accidents or falling from a considerable height. This isn’t to be confused with a non-traumatic brain injury, which is an injury to the brain not caused by physical trauma. This could be caused by a stroke, haemorrhage, tumour, aneurysm or an infection. In 2007, Mr M suffered a severe TBI after being involved in a coach accident on his skiing holiday. He was eager to get back to teaching just a few months after the accident, not realising the severity of his injury. First and foremost, it was vital his case manager and family helped educate him on his TBI and how it affected his cognitive skills. Initially, Mr M struggled with his memory, motivation, initiation, organising and planning. After working with the vocational psychologist and neuropsychologist that his case manager recommended, he received the support he needed for his rehabilitation and reintroduction to teaching. During the rehabilitation Mr M came to realise that teaching independently was overwhelming, so he took control and made the decision to retire from his profession. He has set new goals and taken on a wealth of new skills. Some of his new hobbies include attending a night school to qualify as a day skipper, qualifying to drive a power boat, qualifying as a cricket umpire and volunteering in the local community. As you can see, PTSD and TBI affect the brain in different ways. But, what symptoms do they share? Further down we will also discuss how these affected areas also contain conflicting symptoms and explain how the two conditions vary. Cognitive skills refer to the brains ability to read, learn, process information, remember, reason, and pay attention. Those with PTSD and TBI may both suffer with initiative and motivation. Headway tells us that problems with starting tasks are common, but this should not be mistaken with laziness. These symptoms could also be a result of depression, which can be common amongst those with PTSD. Trouble with expression of thoughts and feelings is another prevalent symptom. Often those suffering with either of these conditions can feel alone, isolated and that they have no one to turn to. Even if friends, family and professionals are there to offer support, communicating how they are feeling inside their heads can be a challenging task. As both conditions are a result of a traumatic event, physical symptoms may be likely to occur. This could include loss of mobility, weakness, paralysis, ataxia or spasticity. Although issues with memory can be a shared symptom of PTSD and TBI, the way it affects the person is very different. With PTSD, memories are intrusive and relived repeatedly. The person may be unable to stop thinking about the traumatic event, and this can lead to nightmares or panic attacks. For this reason, the person is usually unwilling to discuss the memories of the event as it is too traumatic and painful. With regard to a TBI, the person suffers more with memory loss. In the short term, they may not remember the event that led to the injury. In the long term, it may affect day to day life if they are unable to form new memories. This depends on the severity of the brain injury. A common symptom of PTSD is a reluctance to talk about the traumatic event or experience. This can make it difficult to enrol the person in counselling or therapy. This can differ to someone with a TBI who may openly talk about the traumatic event and continuously repeat the topic, which is known as perseveration. Although they may share similar emotional symptoms, the way they are shared and expressed can be very different. Someone with PTSD is likely to supress these emotions and feel unable to share them with anyone in their support network. In someone with a TBI the emotional affects are likely to be more visible and a personality change is more evident to those close to them. If someone with PTSD hasn’t suffered a brain injury, the physical effects (if any) are likely to be more visible. For example, an ex-serviceman may have suffered a limb injury that lead to amputation. With a TBI, the physical symptoms can be harder to detect. Sensory loss, fatigue and speech difficulty are common physical symptoms of this type of injury. At AJCM we have a strong belief in the importance of setting goals. If you or a loved one is struggling with a brain injury, we urge you to find the right support, so you can gain control of your life again. It is overwhelming for anyone to cope with this on their own, and there is so much help available to get you on the road to recovery. A case manager takes away the stress of organising treatment, seeking out professionals and creating rehabilitation plans. Our team of passionate case managers have the experience, values and knowledge to guide you through the best plan for your circumstances. Get in touch today for free, impartial and professional advice.